Why do thousands of people care if Google Reader is discontinued? Why is Pope Francis being called “the unpredictable pope?” Why would a red nose help save the world? Discover these answers (plus the ratio of a circle’s circumference to its diameter) and start tweeting with the #trends. This is by far the most action Google Reader’s seen in awhile. On March 13, 2013, Google announced that they are discontinuing web feed RSS aggregator Google Reader. Although the online news-reading service had a loyal following, they’ve been dropping like flies for a while now. Most can live without Google Reader, but talk about bad marketing timing. Saying that they wanted to focus on fewer products, Google launched their new product for Android users, Keep, just one week after announcing adios to Google Reader. Giving users a sunset period until July 1 to move all their data, people are criticizing Google for their lack of commitment to keeping their data safe over the long haul. Some are even going as far as saying that we can’t trust them to hang on to our data for any significant amount of time. This spurred partly because Google Keep, a free note-taking app that syncs with your Google docs, is very similar to the late product, Google Notebook, that had a similar fate to Google Reader back in 2009. 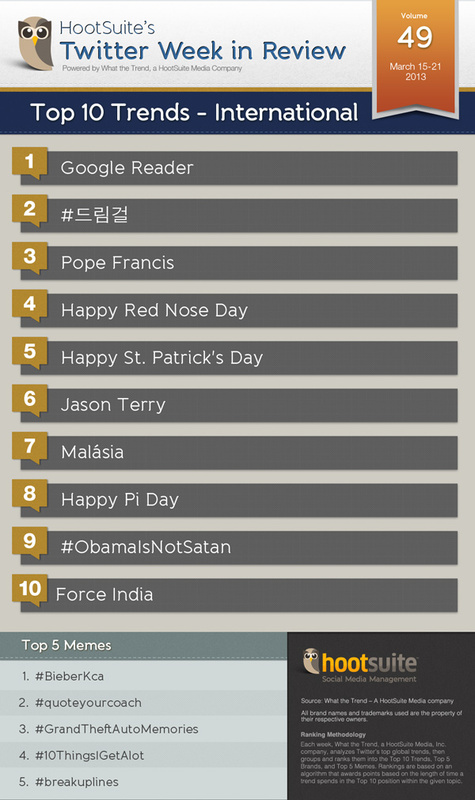 Both the loss of the product, the controversy around keeping data safe and the launch of Keep, caused Google Reader to be a number one international trend. Is any press good press? The hashtag #드림걸 is Korean for “Dream Girl,” a double album and single by South Korean R&B superstar boy band SHINee that was released this February. Why trend now? South Korean pop television show, M! Countdown polls weekly Korean pop charts and fans pushed votes in Twitter for their favorite bands and pop stars. This voting push for SHINee was successful and the band won the music television show’s top prize three weeks in a row in March, which is apparently dubbed the “triple crown.” South Korea sure knows how to get their favorite pop stars to trend globally. And as if that isn’t enough, it was revealed this week that Pope Francis won’t be celebrating Holy Thursday mass (a major pre-Easter event) in St Peter’s basilica nor the basilica of St John in Lateran as per usual. Instead, he will be in the Roman chapel of the Casal del Marmo penal institute for minors and young adults, washing the feet of 12 inmates. This ritual designed to commemorate Jesus’s gesture to his disciples after the Last Supper. According to the Vatican’s damage control, when Francis was the Archbishop of Buenos Aires, he celebrated in a similar fashion in prisons, hospitals and shelters for the poor. Could this be the new industry standard for popes? The money raised on Red Nose Day not only unites the nation in trying to make a difference, but also provides aid and support to countless people across Africa and the UK who are facing terrible injustice or living in desperate poverty. This hashtag was used to wish everyone involved a Happy Red Nose Day. Need I say more? Believe it or not, but St. Patty’s Day is more than just a day for people to bring out their inner Irish by pub crawling with beaded necklaces and lucky charms. It is a cultural and religious holiday celebrated after Saint Patrick (c. AD 387–460), the most commonly recognised of the patron saints of Ireland. While the holiday has religious meaning and celebrations in Ireland, North America’s taken it to another level by wearing green, watching parades and drinking beer. LeBron James didn’t let fellow NBA player DeAndre Jordan stay in the slam dunk spotlight for long. After DeAndre flattened Brandon Knight with a massive alley-oop pass and dunk on the court last week, embarrassing tweets were circulating Knight. But since then, Boston Celtics’ Jason Terry suffered a similar fate at the massive wall that is LeBron James. Like last week, James took an alley-oop pass and dunked over Terry, who tried in vain to block him and fell onto his back. Classic story – classic sports trend. Pi. Besides being a yummy collaboration of crust and fruits or berries, or being known for sitting on open window-sills and coaxing noses from afar, is a very long mathematical equation. 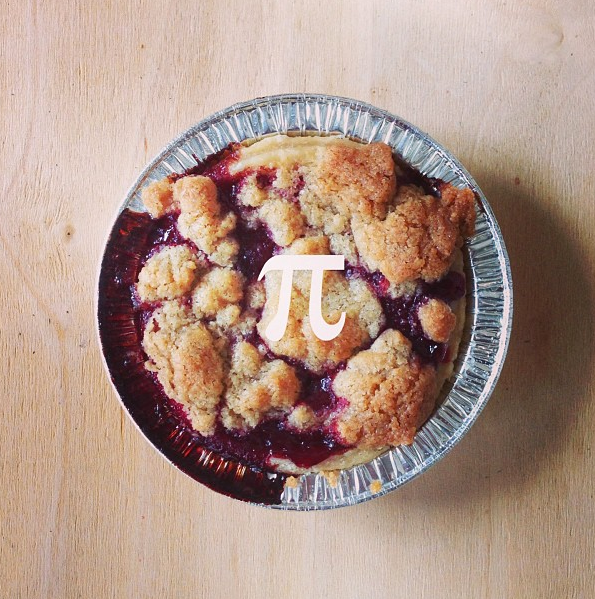 Every March 14th people around the globe celebrate latter kind of Pi. The number pi, with the symbol π is a mathematical constant that is the ratio of a circle’s circumference to its diameter, and is approximately equal to 3.14159…(goes on forever). 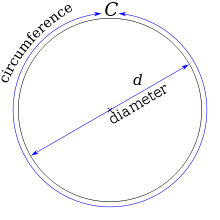 The circumference of a circle is slightly more than three times as long as its diameter. The exact ratio is pi. Why celebrated on March 14th? Because of 3.14. Premiering on March 3 is The History Channel’s controversial miniseries “The Bible.” This religious miniseries certainly has received its fair share of reviews and buzz lately. But what does this have to do with Obama? Conservative commentator Glenn Beck was among the first on Twitter to point out that the Moroccan actor portraying Satan in the Biblical series, looks similar to an old and sinister version of President Barack Obama. While some people in Twitter admitted the resemblance or found it funny, most Americans didn’t appreciate the humor. Go figure. While the History Channel denied any disrespect to the president, his 28 million loyal Twitter followers didn’t take it lightly. Wasn’t that fun? See you next week!